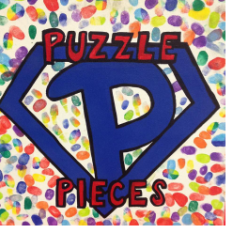 Downtown Fall Fest - Welcome to Puzzle Pieces! Our 1st Downtown Fall Fest was great and successful! 2014 Downtown Fall Fest Chili Cook Off Winners were Old Hickory BBQ and Whitesville Elementary. Imperial Lawns won for the Hottest! Congratulations!! Thank you to all the contestants who took the time to share their great chili with us!! Games/Booths - 10 tickets for $3.00/Armband for $10.00 Join us for bowling, face painting, inflatables, cake walk, tattoos, wagon/hay ride, pumpkin painting, and much more. Chili Cook Off - 11:00am - Owensboro Businesses & Schools compete for the title of best chili in Owensboro. You can participate in the taste testing starting at 11:00am. $5.00 taste test up to 10 samples, $10.00 taste test all vendors. Our Celebrity Judging starts at 12:00pm. See the flyer below! Apple Cider & Sundaes, Food, Live Entertainment, & More! BBQ by Jerry Morris of Angels for Ashley -Presale orders taken through 11/3, pickup during Fall Fest 11-2 Download the flyer below for the order form! !